We have always been warned that coughs and sneezes can spread diseases. But now the true scale of the risk has been revealed. A single wayward sneeze from a rush-hour commuter can end up giving up to 150 fellow passengers a cold in just five minutes, researchers have found. Unless they are contained in a tissue or handkerchief, the germs spread so quickly that within seconds they are being passed on via handrails on escalators or seats on trains, said their study. The researchers surveyed 1,300 workers about their health and found almost all commuters suffered at least one cold last winter. The results were analysed by cold and flu expert Dr Roger Henderson, who looked at the daily commute of the sneeze itself. 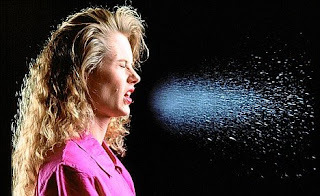 A single sneeze expels 100,000 droplets into the air at a speed of 90 mph. Individual droplets get transferred to handles, rails and other areas constantly held or touched. Up to 10 per cent of all commuters will come into contact with an area infected by that one sneeze, Dr Henderson calculated. In the busiest areas, such as escalators at stations, this amounts to around 150 people during rush hour, he said. The research found that in contrast, only 58 per cent of those who work from home regularly caught a cold last winter. This compares with 99 per cent who travel by Tube, 98 per cent who go by bus and 96 per cent of train passengers. But it falls to 88 per cent of those who walk to and from work, according to the survey. Regular commuters are well aware of the symptoms of others even though they are not always sympathetic, the researchers added. They found 20 per cent are annoyed by fellow travellers sneezing without using a tissue and 33 per cent are angered by those who cough without covering their mouths. Men are more likely to be at fault - one in three do not carry a tissue compared with 81 per cent of women. Relentless sniffing gets on the nerves of 12 per cent of travellers, although throat-clearing is only an issue for three per cent. But most will either walk away or grin and bear it. Only eight per cent will actually say anything to an annoying sneezer or cougher sitting next to them. Perhaps they realise they are just as guilty as two thirds (67 per cent) admit to travelling in to work even when they are feeling ill.
Hanna Nowak, of Lemsip Max All In One, which conducted the study, said yesterday: 'We can't totally avoid germs but we can do a lot to stop them spreading, especially when you're on a crowded commuter train. The company is offering cold and flue advice which includes stocking up on tissues and not leaving old newspapers behind.